You’ll love the cool, refreshing crunch of these nutrient-packed spring roll bowls. 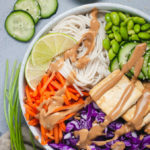 Tofu spring rolls with peanut dipping sauce are one of my go-to pre-made Trader Joe’s meals. And, of course, I must make a homemade version of all of my favorite storebought goodies (ahem, lentil quinoa soup or vegan chorizo, anyone?). 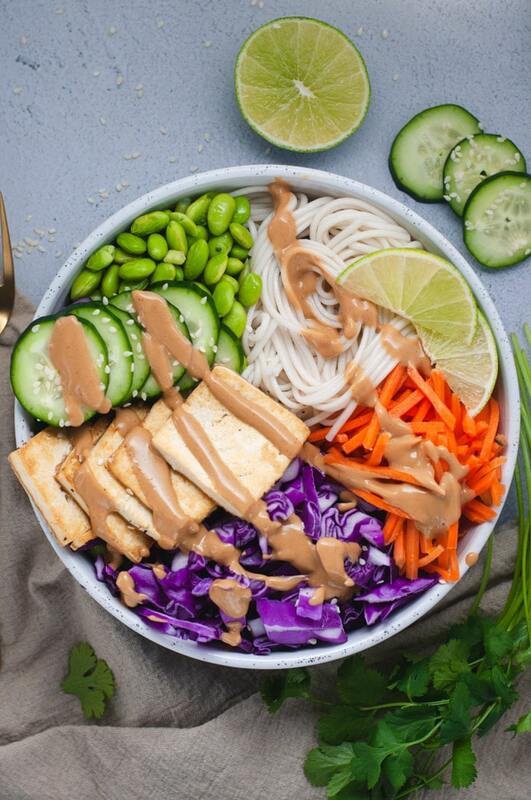 Tofu and Veggie Spring Roll BOWLS! Behold, all of the delicious ingredients in traditional spring rolls (and maybe a few more) mixed up into a bowl. Top with peanut sauce and you’re all set. This post is part of the Recipe Redux monthly recipe challenge. This month we registered dietitians were challenged to share a recipe with an ingredient that’s new to us or an ingredient that may be new to others. Sesame oil! Bonus sesame: these spring roll bowls are also topped with sesame seeds. Sesame oil is a sesame-seed derived oil used in many different Middle Eastern, Asian and African cuisines. A little bit goes a long way with sesame oil, thanks to its strong toasted flavor. In this recipe we’ll saute thinly sliced tofu in sesame oil until its nice and crispy. Pro tip: Start sauteing the tofu while you prep the other ingredients. A little bit of multitasking cuts down on the meal prep time by 10 minutes. 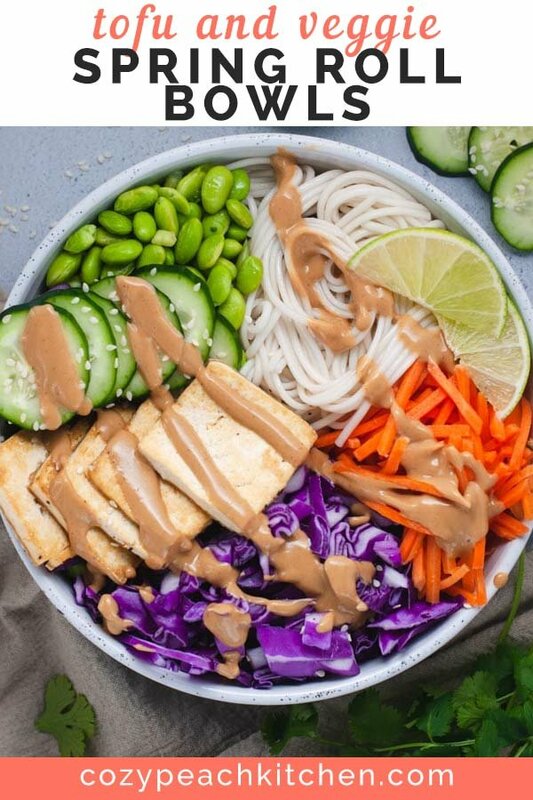 What’s in these tofu spring roll bowls? A double dose of plant-based protein. 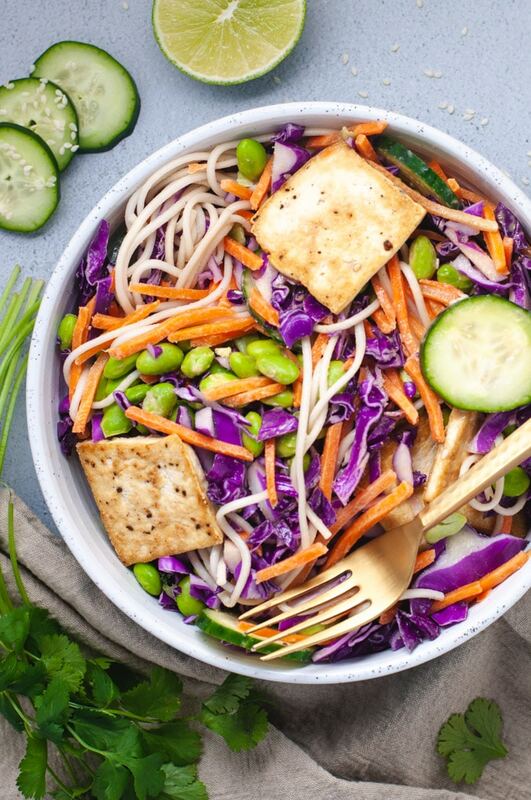 Edamame and pan-fried sesame tofu are both whole-food sources of soy. 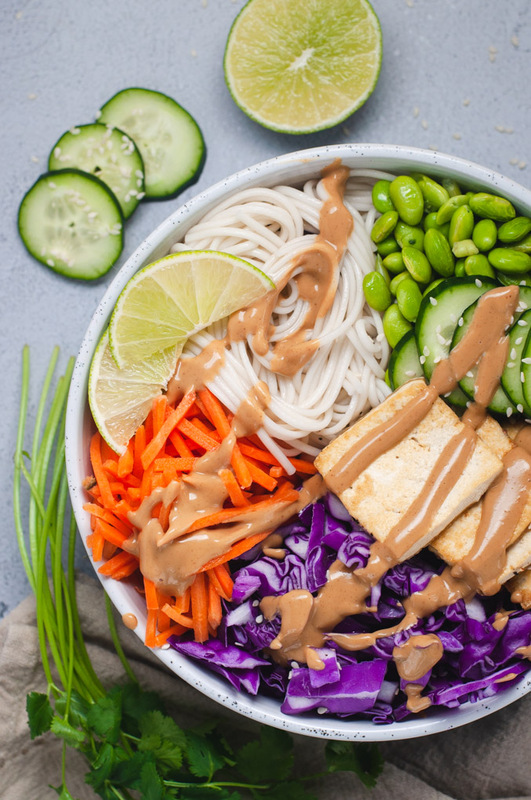 Tofu and edamame are low calorie, nutrient-dense protein sources. Refreshing crunch. 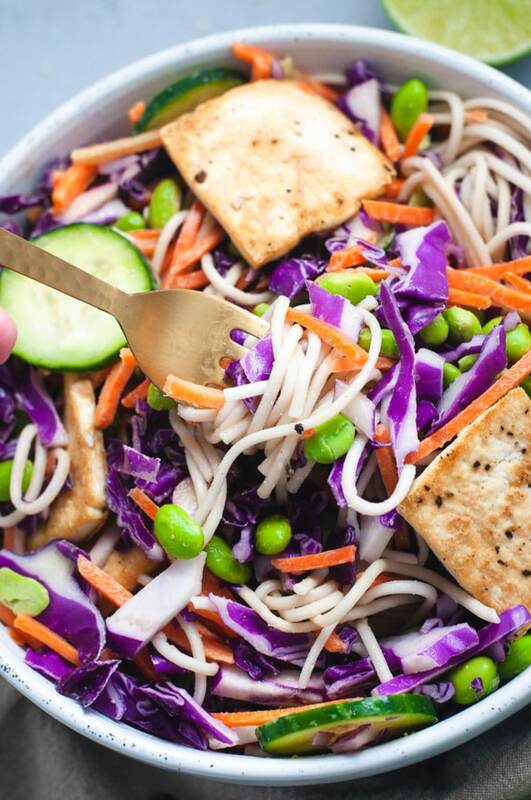 Purple cabbage, shredded carrots, and sliced cucumbers contribute crunch and refreshing flavor. Udon noodles. These wheat noodles can be swapped out for rice or glass noodles to make this dish gluten-free. Peanut sauce. A savory, creamy peanut sauce like the kind used for dipping spring rolls. The peanut sauce is simple but flavorful. It too uses a dash of sesame oil, in addition to peanut butter, rice wine vinegar, soy sauce, and water. Just mix these ingredients together until a smooth, creamy sauce forms. Ta-da! Peanut sauce. 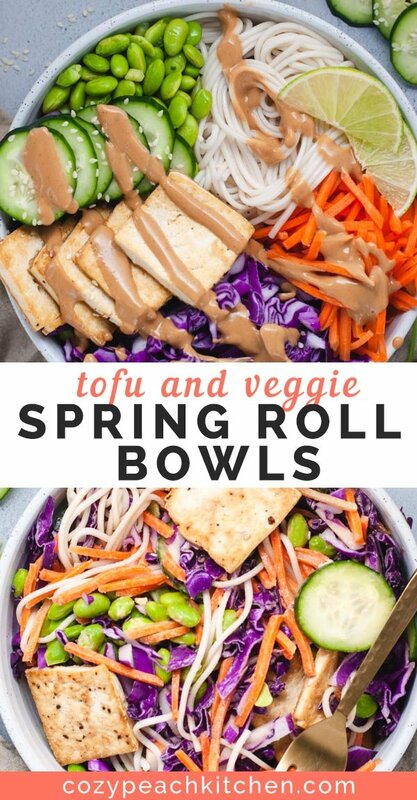 These tofu spring roll bowls make it recipe #5 of my Meal Prep Monday series. 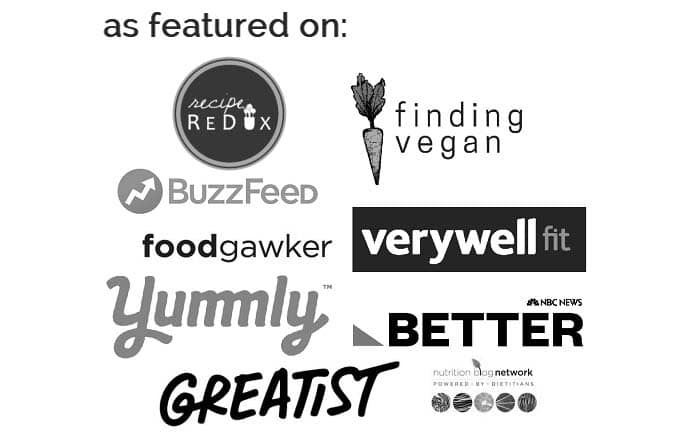 You can check out the other vegan meal prep recipes in the series here. Crispy, crunchy deconstructed spring rolls made with fresh veggies and sesame tofu. Topped with a savory peanut sauce. Cook the udon noodles according to package instructions. While the noodles are cooking, prep the tofu. Slice the extra firm tofu into thin squares (about 1 cm thick). Heat the sesame oil over medium heat in a large skillet. Layer the tofu slices evenly in the skillet; you may need to do 2 rounds of sauteing, depending on your skillet size. Saute until lightly browned, then flip. This will take about 5 minutes on each side. 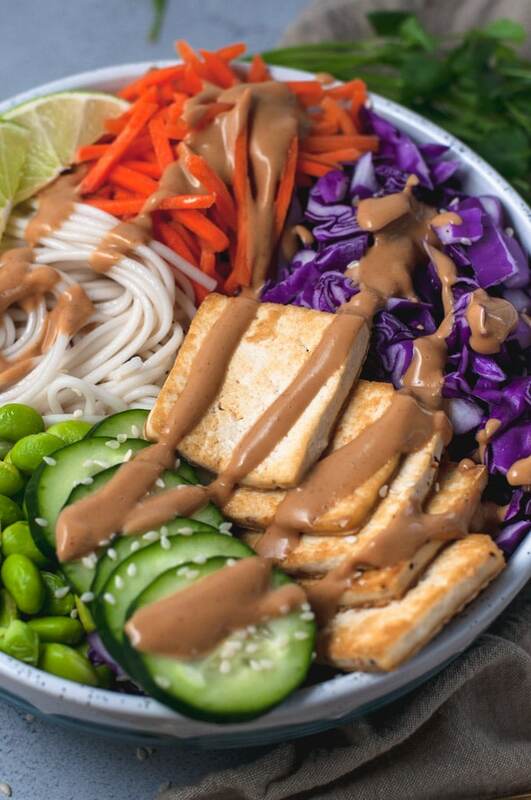 While the tofu is sauteing, prep the cabbage, carrots, and cucumber. Heat the edamame according to package instructions. For meal prep, assemble the ingredients into four different containers. Mix the peanut sauce together in a small bowl. Drizzle over the spring roll bowls. Sprinkle with sesame seeds, a squeeze of lime, and fresh chopped cilantro. Enjoy! Shredded carrots: I buy preshredded carrots, but you can also grate large carrots or chop into matchsticks. Purple cabbage: This can also be bought preshredded, but I usually buy a large head of cabbage and slice it. To do this, slice the cabbage into thin strips, then chop into smaller pieces. Frozen edamame: Find labeled as "mukimame" in the freezer aisle. This means shelled edamame.